After a soggy Saturday, the sun returned Sunday under mild temperatures. Highs were in the mid 40s across Southern New England and 30s to the north. A cold front dropped from Canada, bringing several inches of snow for the mountains, especially the ones in Vermont. There was a chance places of Central Massachusetts, Northern Connecticut and Rhode Island see some light snow/flurries in the afternoon courtesy of a stiff northwest wind. Behind this front, temperatures will plunge and we could get the coldest air mass of the season so far with lows in the single digits and teens. So it will be a cold start to our Monday, but at least the wind won’t be gusty as high pressure will quickly take control of the region. Highs will hover around the freezing mark. Expect bright sun early, then clouds will increase from west to east throughout the day Monday ahead of our next storm. Sunday Night: Clearing skies. Colder. Teens to low 20s. Monday: Sunny & chilly. Clouds thicken late. Near 30. Tuesday: Some early mix of rain/snow turning to occasional showers. Warming to the low 40s. Snow arrives after midnight and just in time to impact your morning commute. 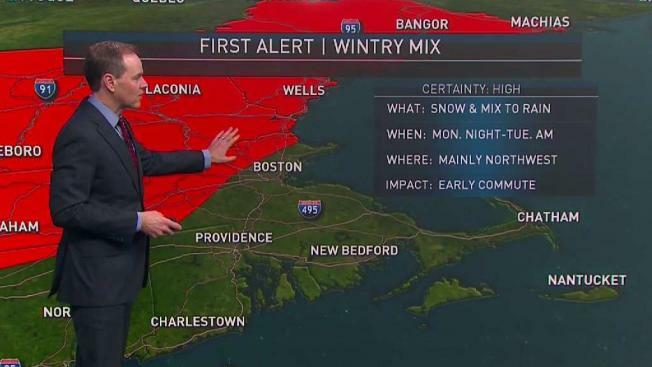 This is the main reason why we (your First Alert Weather Team) have issued a First Alert Weather Day on Tuesday, which will likely affect places to the north and west of Boston. Temperatures will be cold enough for snow/wintry mix at the onset, but then quickly transition to rain south of the Massachusetts Turnpike courtesy of milder air coming in due to a south wind. This system is still a couple of days away and its exact track could shift a bit but what we know is that Northern New England will hit the jackpot with over 4 inches of snow in many locations, and up to a foot of snow in Maine. Meanwhile, a dusting to an inch of snow is possible for Metro West all the way into the city. The Merrimack Valley and higher elevations in Worcester could get up to two inches starting Tuesday and ending Wednesday. We stay unsettled Wednesday, as this area of low pressure intensifies in the Gulf of Maine and ushers in more moisture and colder air, which will lead to snow showers on the back end that could make it all the way into Boston. We dry out and cool down again Thursday with below average temperatures at the end the week. Our exclusive 10 day forecast hints at another system arriving next weekend, and this one seems to have enough cold air in place for snow. We will have to wait and see how it evolves.